You’ve leased your property to a great new tenant and they’ve even paid 6 months’ rent in advance. Everything seems to be going smoothly until, passing the property a few months later, you notice a ‘For Sale’ sign outside? It turns out that your great tenant is in fact a fraudster who has stolen your identity and put your house on the market. Although a very simplified example of one of the ways it can happen, it is an unfortunate truth, that in 2019 ‘property hijacking’ is still a widespread problem. 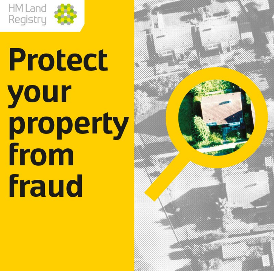 The HMLR counter fraud team use gathered intelligence, partnerships with fraud prevention organisations and concerned citizens, to help stop fraud, we require landlords, like yourselves, to take an active step in protecting yourself against potential identity fraud. But the good news is that those steps are quick, easy and free! Property is probably the most valuable asset you own. It can be sold or mortgaged to raise money and can therefore be an attractive target for fraudsters. If you rent a property, or if it’s empty, and the property is mortgage free you are more at risk. In 2017/18 we assisted in stopping fraud on property valued in excess of £15.5 million and since 2009 we estimate that figure to be in excess of £140 million. The type of frauds HM Land Registry see are where fraudsters steal your identity and sell or mortgage your property by pretending to be you. If the fraud isn’t discovered promptly, you as the true property owner might find your property has been mortgaged or sold without your knowledge. Fixing it can be distressing, time-consuming and costly for all innocent parties. Thankfully property fraud is still quite rare, but if you are the unlucky victim, it can have devastating effects. Prevention is therefore better than cure. We received an application against two high-value London properties. Both properties were tenanted and the address for service on the register for the owner was the property address. Following an initial assessment of the application, we requested amendments to the application form and transfer deed. The need for these amendments raised suspicions concerning the validity of the application and prompted the caseworker, following a referral to our counter fraud team, to raise further queries. Notice was served on the owner and they wrote in stating they believed the property had been fraudulently sold without their knowledge and objected to the application. No response was received from the solicitor who sent in the application. Because of the inaccuracies identified within the application, the lack of communication from the solicitors acting for the Buyer and the objection received from the registered owner the application was cancelled and a potential loss of more than £3.5million was prevented. So how can you protect yourself and your property? • Ensure your property is registered. If you become an innocent victim of fraud and suffer a financial loss, you may be compensated. If your property isn’t registered, then no compensation is payable. Find out about registering land. • Make sure your contact details are up-to-date so we can reach you easily. You can have up to three addresses on the register including an email address or an address abroad. If your details are not up to date, you may not receive our letters or emails if we need to contact you. • Sign up for HMLR’s free Property Alert service. We send email alerts when there is certain activity on a monitored property for example if someone tries to register a mortgage. You can monitor up to 10 properties and you do not have to be the registered proprietor, you could monitor your parents or grandparents house for example. If you receive an unexpected alert, you can decide whether to seek further advice. See our YouTube guide to setting up Property Alert. • If you feel you might be at risk you can request a restriction on your property. A restriction is intended to stop activity on the property, such as a transfer or a mortgage, unless a conveyancer or solicitor confirms the application was made by you. There is no fee to homeowners who do not live at the property they wish to protect. Request a restriction. • If you are a company wanting protection you can make a request to enter a restriction on up to three properties, free of charge, on form RQ(Co). A solicitor must certify that they are satisfied the company transferring, leasing or mortgaging the property is the same company as the owner before any new sale, lease or mortgage is registered. They must also certify that they have taken reasonable steps to establish that anyone who executed the deed on behalf of the company held the stated office at the time of execution. • Contact HMLR’s property fraud line on 0300 006 7030 (Monday to Friday, 8.30am to 5pm) or email [email protected]. • Contact a legal professional such as a solicitor or Citizens Advice and Action Fraud (actionfraud.police.uk). For more information visit www.gov.uk/propertyfraud. « No DSS! Closing the door on tenant discrimination.